Located on the upper floor of a neoclassical building, Castello Domus offers self-catering accommodation in Panormos Village of Rethymno, just 100 metres from the beach. Surrounded by lemon groves, the family-run Anna Boutique Villas features elegant, self-catering accommodation with a private pool and furnished sun terrace. Located in Giannoudi Village of Rethymno, the traditionally-built Villa Givera features a private swimming pool surrounded by a blossomed and furnished sun terrace. Located in Magnisia Village of Rethymno, within 800 metres from Scaleta Beach, Villa Zafira offers self-catering accommodation with a private pool. Within 700 metres from the natural springs of Agia Dynami, Argiroupolis Dimitris offers rooms with free Wi-Fi and balcony overlooking the Cretan Sea and the mountains. Shops, restaurants and cafes are within short walking distance. Centrally located in the scenic Rethymno Town, 100 metres from the beach and 500 metres from the Fortezza, Rethymno House offers air-conditioned rooms with free Wii-Fi. Shops and restaurants serving Cretan cuisine are within 50 metres. 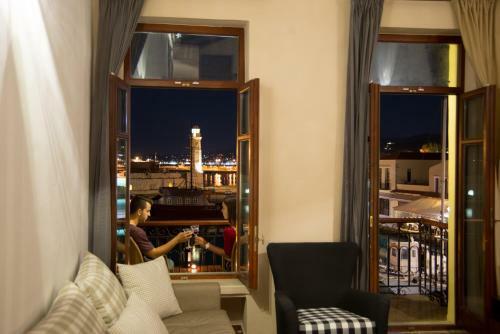 Centrally located in the old town of Rethymno, within 400 metres from the Fortezza, the Venetian-style Makri Steno has an internal sun terrace and provides free Wi-Fi throughout. 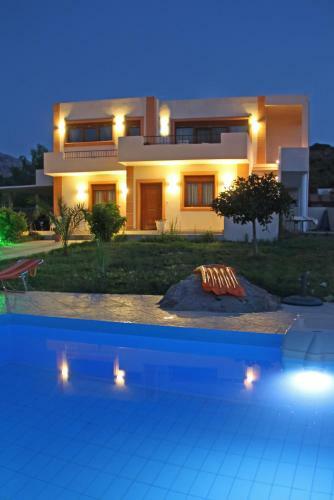 Set in Mikro Metochi, this air-conditioned villa features a garden with a seasonal outdoor pool and a barbecue. Guests benefit from terrace. Free WiFi is provided throughout the property and free private parking is available on site. Located in the picturesque village of Margarites in Crete, Green Paradise Villa includes 350 m� of outside space including a private pool, BBQ and sun terrace. It offers a balcony with sea and mountain views. Offering a garden with BBQ, Argiroupolis Maria Rooms are in Argyroupoli Village, 700 metres from the Holy Power springs. They have air-conditioned accommodation with a balcony and free WiFi. Facilities include a shared kitchen and a sun terrace. Located 3 km from Panormos Beach in Roumeli, Cretan Residence Villa Dimitrios & Eva are modern accommodation units that feature a private swimming pool with a sun terrace, and a children�s playground. Free Wi-Fi is available in all areas. 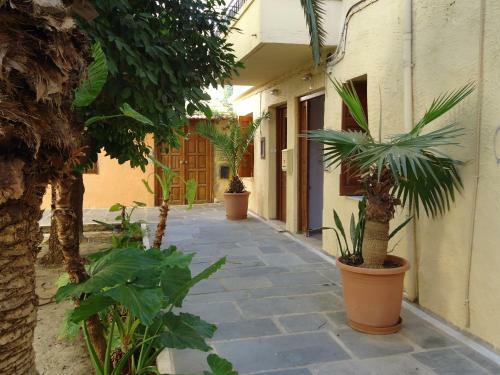 Just 20 metres from Rethymno Beach, Family Homes Zaharias feature a garden and a sun terrace. They offer self-catered accommodation with flat-screen TV. Free Wi-Fi is available throughout. The centre of Rethymno Town is 1.3 km away. Holiday Home Rethymnon - 09 is a holiday home located in Episkop�- Rethimno, 35 km from Chania Town. The unit is 41 km from Bali. Free private parking is available on site. Located 41 km from Heraklio Town and 12 km from Bali, Holiday Home Lessogea Villa - 07 offers accommodation in Margar�tai. 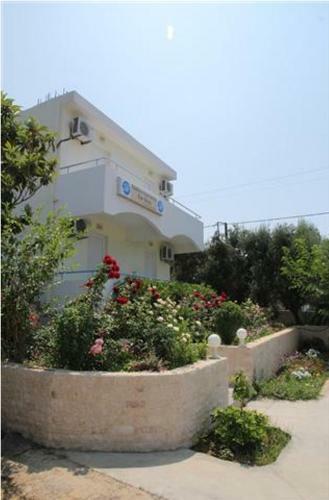 The unit is 20 km from R�thymno Town, and guests benefit from free WiFi and private parking available on site. Offering a shared pool, Iperion Apartment G2-2 is surrounded by olive groves, within a short drive from Agia Triada Village. 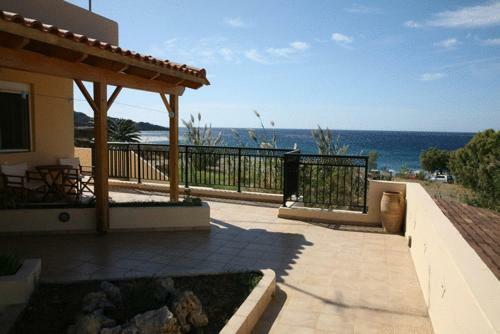 It features a fully equipped unit with Cretan Sea, mountain, pool and garden views. Facilities include a BBQ. Located 400 metres from the centre of Rethymno Town and 900 metres from the beach, Lamno Studios offers air-conditioned studios with balcony and free internet. A kitchenette with cooking facilities and fridge is included in all studios at the Lamno. Only 10 metres from the sandy beach of Mysiria and 3 km from Rethymno Town with its Venetian Harbour, Camping Elizabeth offers a taverna, snack bar and free WiFi throughout. It features air-conditioned accommodation with patio. Seeblick Studios & Rooms is located in Rethymno, just 50 metres from the Old Town and within 100 metres from the Venetian fortress. Offering free Wi-Fi in its public areas, the property features self-catering units with a furnished balcony. Set amongst an olive grove, DM Apartments is just a 5-minute walk from the sandy beach of Platanes. 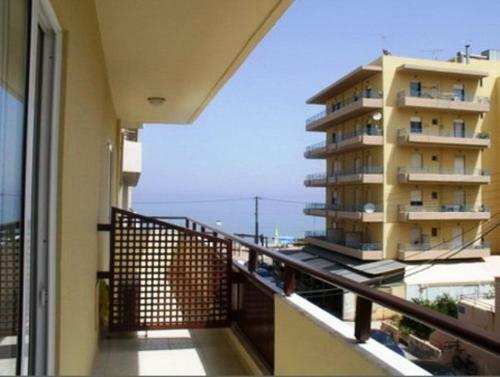 The air-conditioned studios and apartments offer side sea or sea views from their balcony. Just a 5-minute walk away from Platanias Beach, in Rethymno, Marianthi Apartments features a swimming pool, a separate children�s pool and a garden bar. Its air-conditioned rooms enjoy sea, pool or garden views and free Wi-Fi. 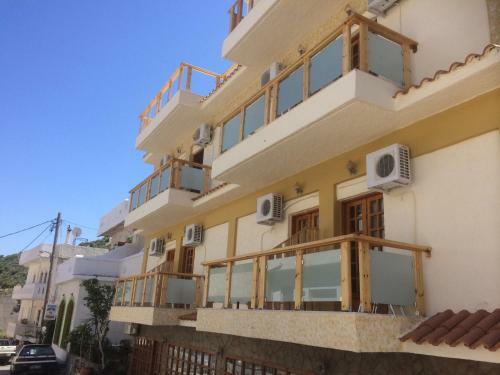 Just 100 metres from the beach, in the area of Pigianos Kabos, Limas Hotel & Apartments offers self-catering accommodation with a private balcony. It includes a swimming pool with sun terrace and a poolside snack bar. Eleon Residence is a luxurious villa complex, situated 1 km from Stavromenos Beach and 9 km from Rethymno. 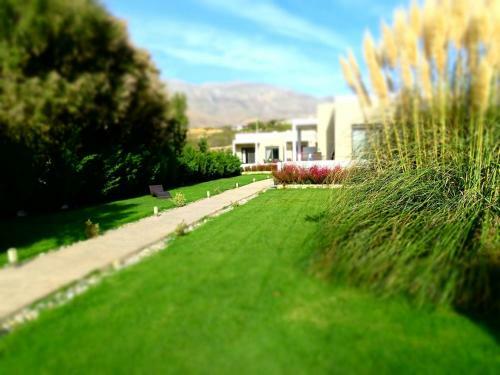 Each villa is set within a private olive garden, has a private pool and a spacious living room with fireplace. Located directly on the seafront of Panormos, Europa Hotel is surrounded by a lush garden and offers a swimming pool, poolside bar and restaurant. 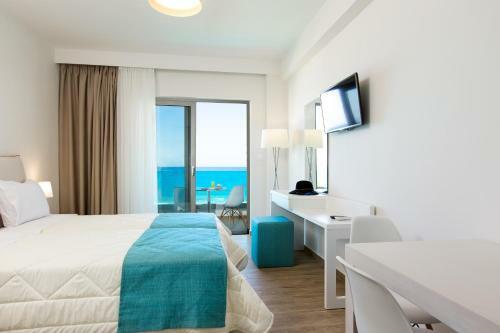 It features air-conditioned rooms with a furnished balcony overlooking the Cretan Sea. Just a 5-minute walk to sandy beach, the family-run Studio Lefaki is centrally located in the old city of Rethymno. Its self-catered studios open out to a communal terrace and offer free Wi-Fi throughout. Ideally located inside the Old Town of Rethymno, Casa Dei Delfini is housed in an old Venetian- Turkish mansion. It offers spacious, self-catering accommodation with private balcony and free Wi-Fi. Located in a peaceful area of Agios Nikolaos, among lush olive trees, Apollonia Villas offers apartments with a fully equipped kitchen and a furnished balcony. 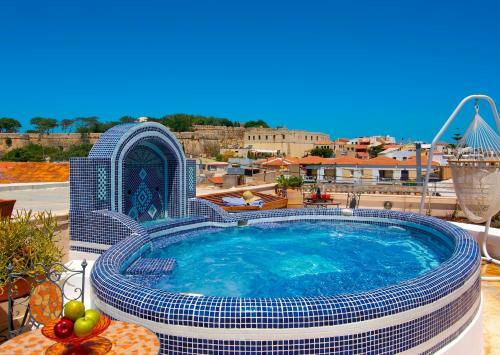 It has a swimming pool with sun terrace and provides free Wi-Fi throughout. 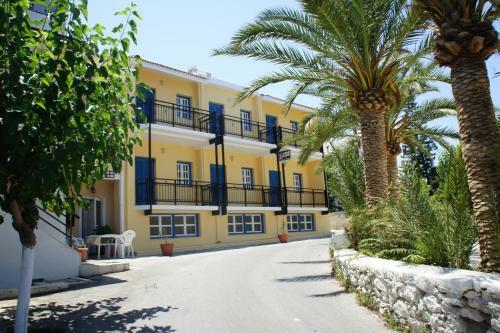 Located on the beach, Nikos and Anna Rooms is located in the coastal village of Rodakino. It features a restaurant, free Wi-Fi in public areas and rooms with a balcony. All of the guestrooms are air conditioned. Just 30 metres from the beach of Limani Panormou, Zozo offers self-catered accommodation with Cretan Sea views. 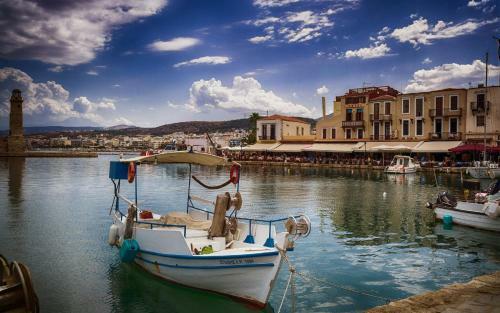 The village of Panormos has a good selection of traditional taverns and water sports facilities. Boasting views of Bali Bay from its terrace and balconies, Manolioudis Villas enjoy a private pool and a well-furnished outdoor area with BBQ facilities. 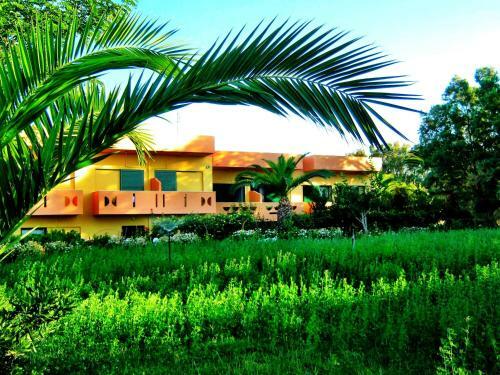 Modernly decorated, the villas feature free Wi-Fi and air conditioning throughout. 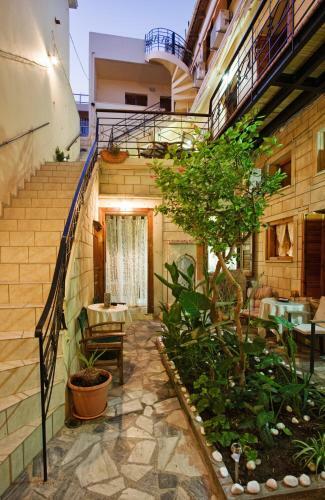 Featuring a sun terrace with views over the Cretan Sea, the Venetian-style Nakli Traditional Guesthouse is located in the old town of Rethymno, just 300 metres from the long sandy beach. It offers self-catering accommodation with free Wi-Fi. 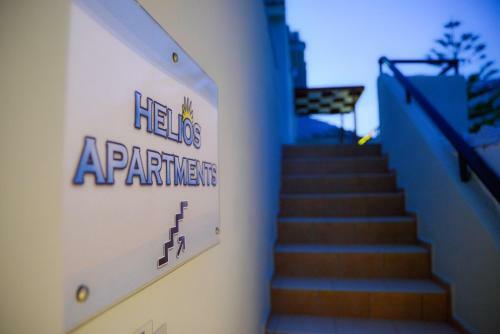 Located in the heart of Rethymno town, these studios and apartments each include a fully equipped kitchenette and balcony. The sandy beach is right on their doorstep, just opposite the building. 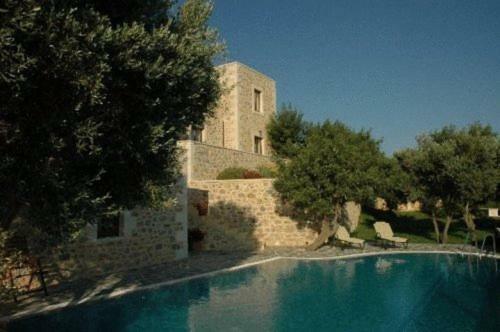 Salvia Villas offers 3-bedroom villas with private pools in Skouloufia village, 18km from Rethymno. The complex enjoys 360-degree views across vineyards, olive trees and the sea. 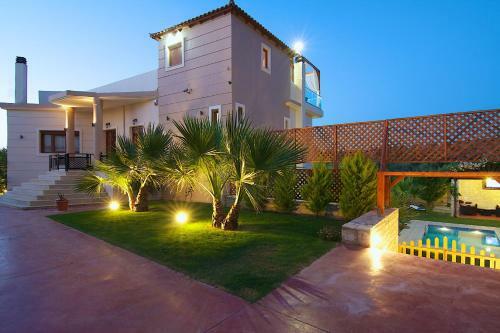 Each elegant two-storey villa has a sun terrace and a balcony. 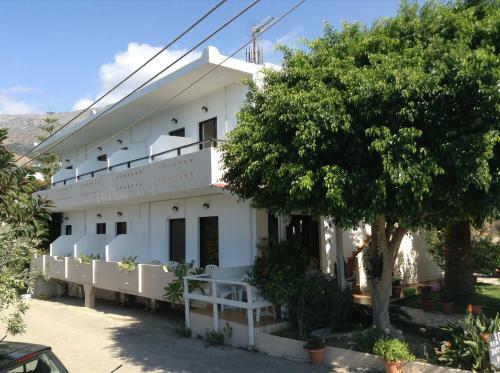 Centrally situated in Old Rethymno Town, right on the seafront, this property is just opposite the beach. 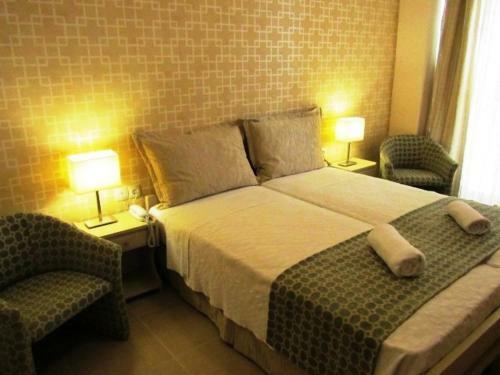 It features air-conditioned rooms with free wired and Wi-Fi internet. The Sea Front Rent Rooms are bright and have wooden floors. Surrounded by a beautiful flower garden, Chrissas Apartments are set in a quiet spot just 50 metres from the sandy beach of Mysiria and 3km from the picturesque Rethymnon Town. Geo Villas feature 2 independent villas with a fresh-water swimming pool. It is located in Skouloufia, 18 km from Rethymnon. The closest beach is located about 6 km away, in Stavromenos. Housed in a historic building formerly used by the French Embassy, Afroditi Hotel stands among the well-known historic centre of the Old Town of Rethymno and the long stretch of sandy beach. Located in Panormos fishing village, 50 metres from the sandy beach, Apartments Christina offer self-catering accommodation overlooking the Cretan Sea. The fully equipped kitchens feature cooker and fridge. Separe House by Ideon is situated in the heart of Rethymno. Offering free public Wi-Fi, the modern guest house features tastefully furnished rooms with private kitchenettes. The stylish rooms have private balcony overlooking the interior courtyard. Located 200 mentres from the sandy beach of Agia Galini in Crete, Kissandros features air-conditioned rooms overlooking the Cretan Sea or the mountains. The hotel offers free Wi-Fi and serves Continental breakfast in the roof garden. 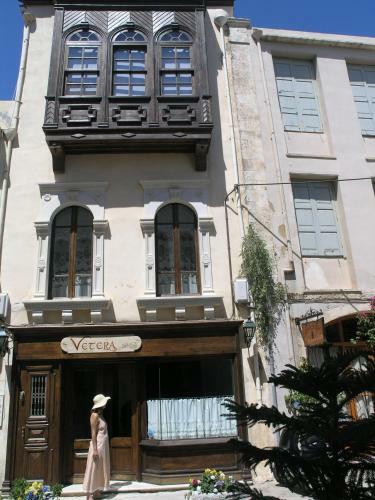 Boutique hotel Vetera Suites offers romantic suites with free Wi-Fi in the Old Town of Rethymnon. 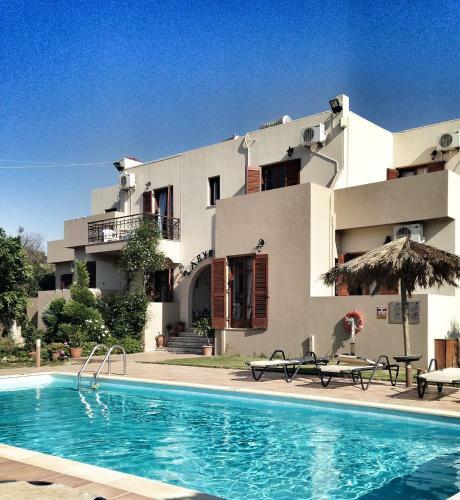 Open year-round, it is only 200 metres from Rethymnon Beach, the Venetian Loggia and Rethymnon Town Hall. Situated on the top of an olive grove, 3 km from Triopetra beach, Litiniana Villas is a traditional stone built complex which offers panoramic view of the Libyan Sea. 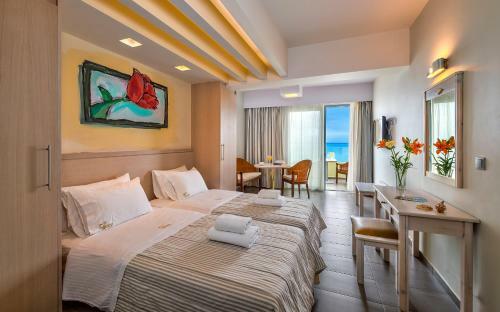 Maistros Exclusive Suites & Gourmet Restaurant offers contemporary suites overlooking the sea and provides personalized service, free wireless internet access and free private parking. Each of the modern suites has plenty of space. Casa Moazzo Exclusive Suites are located in the heart of Rethymnon and at a short distance from the Venetian harbour and only 200 metres from the beach. This luxurious villa complex is located in Mikra Anogia, just 3.5 km from Rethymnon and its port and beautiful sandy beaches. 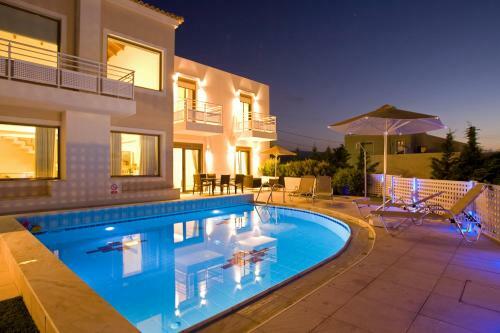 All villas have a private pool with furnished sun terrace. 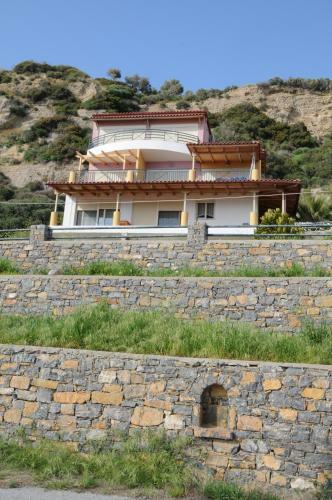 Each villa has a large balcony with panoramic view of the sea. Xidas Garden is set up a small incline built into the hillside surrounded by olive groves and citrus trees with views of the village. The beach is a 200-metre downhill with the resort centre a few hundred meters further. 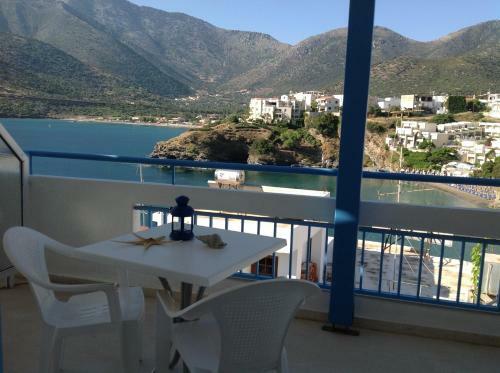 In an olive garden 500 metres from Damnoni Beach in Plakias, Kassiani Studios offer self-catered studios with free Wi-Fi. Each room has a balcony overlooking the Cretan Sea and green landscape. With picturesque views of the Mediterranean Sea to the south and the Cretan Mountains to the north, this hotel offers spacious apartments with a balcony next to the beach. 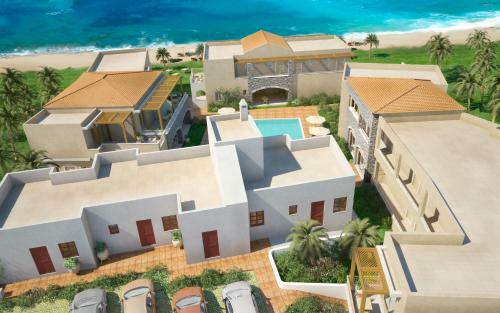 Lefkothea Villas are built among a private olive grove of 5 acres, in Adele Village. 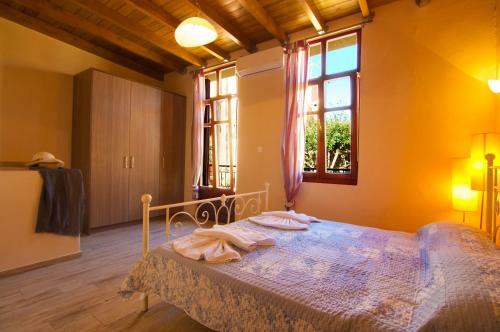 They offer impressive views of the bigger olive grove of Crete and Psiloritis, the island�s tallest mountain, enchanting gardens and absolute calmness. Akti Damnoni is just 20 metres from the beautiful sandy beach at Damnoni. It features a sea-view terrace and a restaurant serving traditional Cretan Cuisine. This Rethymnon hotel is located in the heart of the town, only 30 metres from the organized sandy beach and 600 metres from the Venetian port and castle. Evagellina Studios offers air-conditioned rooms with free Wi-Fi. The family-run Olympia offers rooms with a well-equipped kitchenette and free Wi-Fi access. 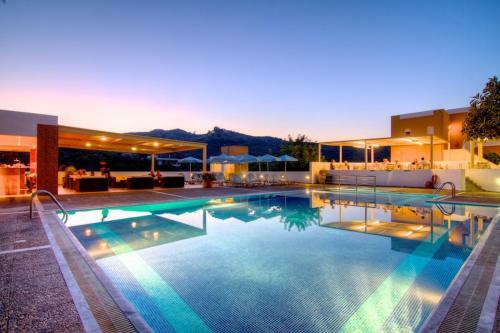 It has a swimming pool, while the sandy beach of Rethymno is just 100 metres away. Hotel Olympia rooms are simply but tastefully decorated. Featuring spacious suites with a complimentary laptop computer and flat-screen TVs in every room, the restored 19th-century residence Casa Maistra is ideally set on Rethymnon�s promenade. Wi-Fi is free throughout. 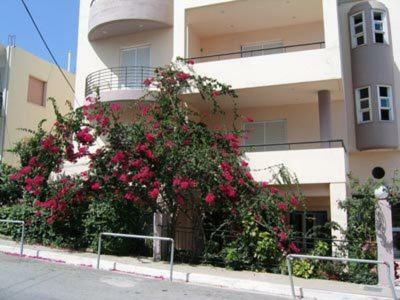 Corali Studios is a modern building located in the beach resort of Plakias. It offers a fish tavern, free parking, and self-catering rooms with TV. The air-conditioned studios and rooms feature a private balcony with various views. The Gold Apartments boast a private beach with beach bar, a swimming pool and separate pool for children. Pool umbrellas and sun beds are provided free of charge. Gold Apartments offers fully furnished, self-catering accommodation. Dating back to the 15th century, this elegantly restored manor house sits on a hill in Atsipopoulo, overlooking Rethymnon�s Old Town. It offers Venetian-style rooms and a large outdoor pool. Located right at the picturesque Venetian harbour of Rethymno Old Town, Faros Beach features a rooftop terrace with views of the harbour and the Cretan Sea beyond. It offers air-conditioned accommodation with free WiFi. The Sea Front Studios & Apartments are situated in the centre of the Old Town of Rethymnon, only 50 metres from the beach. 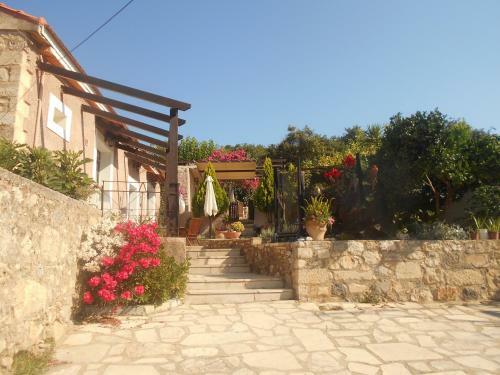 This quietly located, family-run complex sits 500 metres away from the beach of Skaleta. 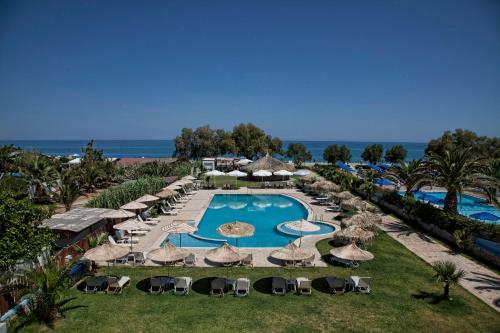 It offers air-conditioned rooms with spacious verandas overlooking the Cretan Sea. Free WiFi is available. 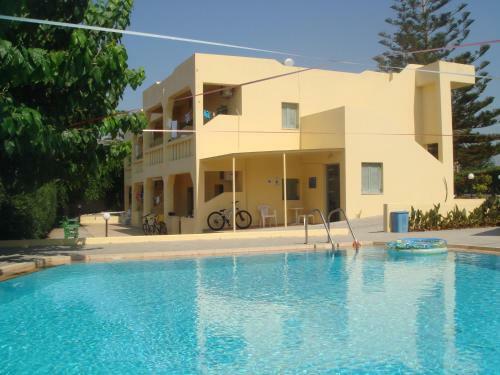 Maravel Apartments are situated in Adelianos Kampos, 7km east of Rethymno. There is public bus service to/from Rethymnon every 30 minutes. The nearest beach is at 70 metres away. Free Wi-Fi is provided throughout. Enjoying a beautiful location on Perivolia�s seafront, Marilyn Apartments offers comfortable studios and apartments appointed with a well-equipped kitchenette and private balcony. Located on the Mediterranean beaches near the ancient Venetian port of Rethymno, the Iperion Hotel features beautiful gardens with a private pool. It includes a restaurant with al-fresco dining area and a beach bar. Offering a wonderful view of the bay of Plakias and the Libyan Sea, this small, modern and comfortable property has a peaceful location right on the beach. Located only 60 metres from the beach of Perivolia, Vesperi Studios & Apartments offers self-catering accommodation with free Wi-Fi and balcony overlooking the garden. Shops are 50 metres away. Traditional houses Kefala 1860 is located in Gonia Village. Built among a lush garden, it opens to a patio and balcony with views of the surrounding mountains. Free WiFi is available throughout. 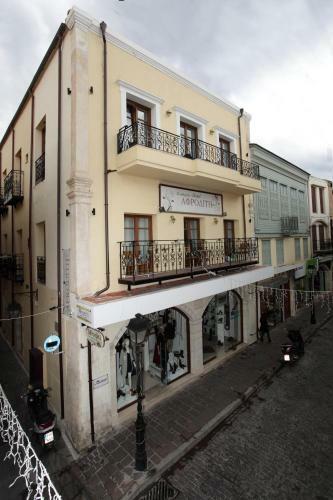 Located in the centre of Rethymno Old Town, Asikiko Suites offer fully equipped accommodation with free WiFi access. 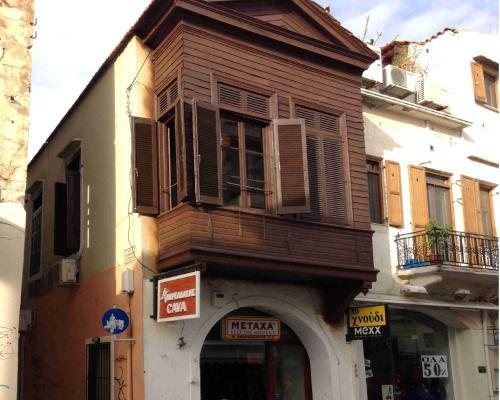 The property is 200 metres from Historical and Folk Art Museum and 200 metres from Archaeological Museum of Rethymno. Located in Panormos area of Rethymno, the family-run Aris Villa offers a private, outdoor pool and a garden with a fountain. This self-catering accommodation opens out to balconies and terraces with Cretan Sea, garden and mountain views. 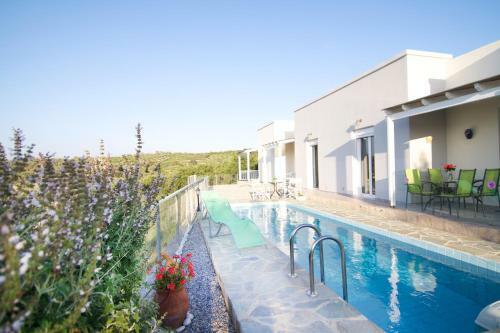 Located in Loutra of Rethymno, Althaea Villas offers an outdoor pool. 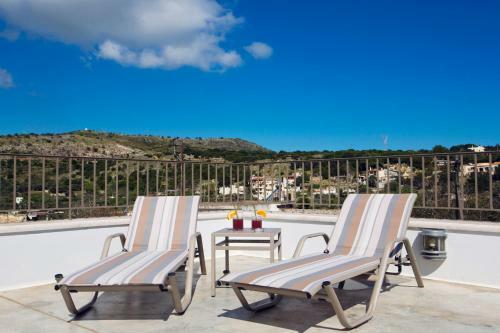 This self-catering accommodation opens out to a balcony and patio with Cretan Sea and mountain views. Free Wi-Fi is available in all areas. City Center Holiday Home provides accommodation in the heart of Rethymno's old town, within 100 metres of the beach, restaurants and the scenic Venetian Harbour. Quietly located in the scenic village of Frantzeskiana Metochia, the elegant Myros House is only a 10-minute drive from Rethymno Town. 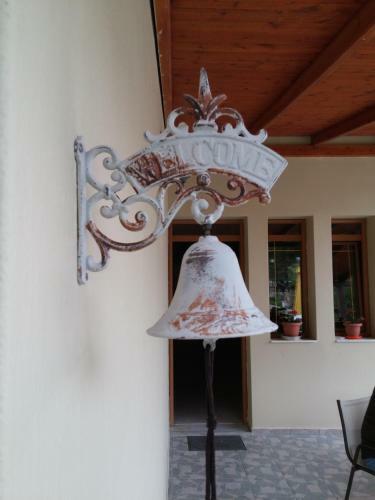 It offers a spacious, furnished terrace with panoramic views of the mountains and countryside. 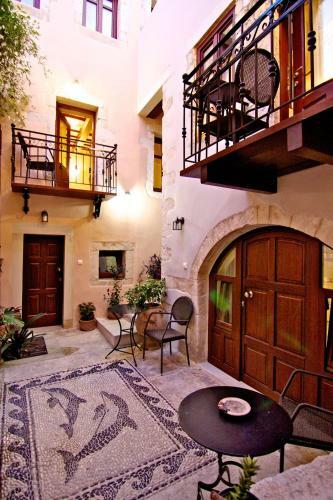 Casa di Maria is quietly located in the old town of Rethymno. This self-catering accommodation opens out to a balcony and patio with Cretan Sea, Souda Cape and Lefka Ori Mountain Range views. The Archaeological Museum of Rethymno is 700 metres away. 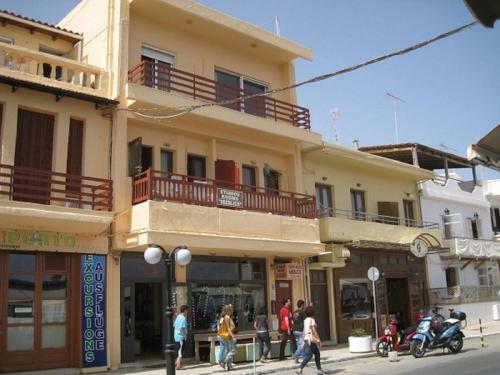 Located in the Old Town of the scenic Rethymno, Lilys Apartments is right next to the beach. It offers air-conditioned apartments with self-catering facilities and free WiFi. All apartments at the Lilys provide with a TV and a terrace. Located in Rethymno, just 10 metres from the sandy beach, Ammos Studios features an outdoor pool with a furnished sun terrace. It also includes a snack bar and provides free WiFi access throughout. Located right on the beachfront in the west side of Rethymno Town, Filoxenia Beach Hotel features an outdoor swimming pool and a kids pool with sea water. 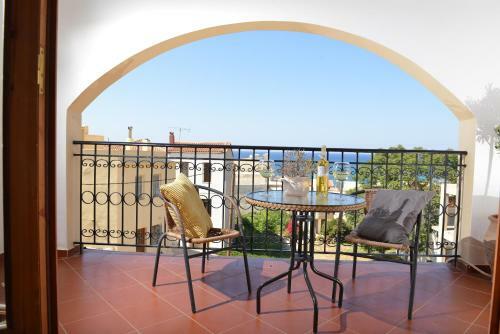 It offers rooms and suites that open to a furnished balcony with magnificent Cretan Sea views. Just 30 metres from the beach of Bali, Ikonomakis Apartments offers self-catering accommodation with direct sea views and free Wi-Fi access. 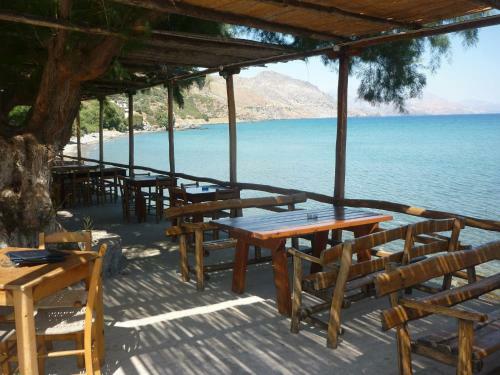 Within walking distance, you will find traditional Cretan taverns and seaside cafes. Just steps from the sandy beach of Rethymno, Golden Coast Apartments offers air-conditioned studios with a fully equipped kitchenette and TV. Wi-Fi is free and available throughout the property. Situated within 100 metres from the beach of Panormos, the stone-built Idili Hotel is 80 metres from the village centre with taverns and shops. 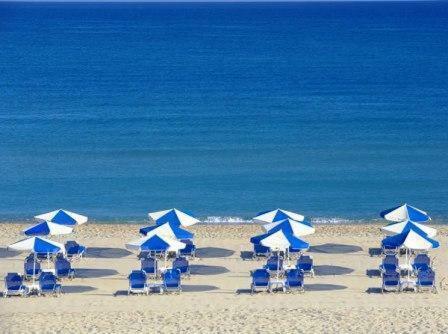 Odyssia Beach Hotel is right on its private beach area, 3.5 km from Rethymno Town. Surrounded by a garden, it features an outdoor pool, 2 restaurants and a poolside bar. A mini shop with news stand is provided. Plakias Suites offers self-contained accommodation 20 metres from the sandy Paligremnos Beach where it offers free umbrellas and sun beds. The complex is surrounded by a garden with sun terrace and features free Wi-Fi. 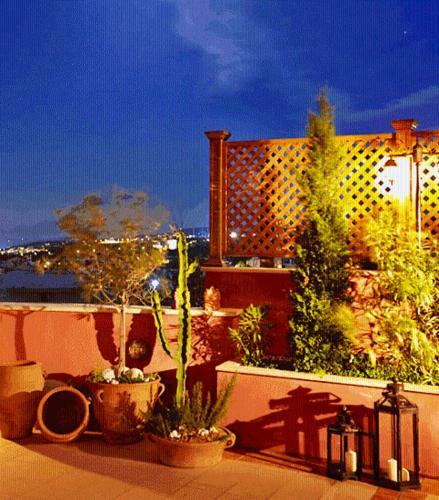 This former Venetian lord�s house is situated in Rethymnon�s Old Town. Avli Lounge Apartments offer charming suites, a rooftop terrace with hot tub and fine dining. 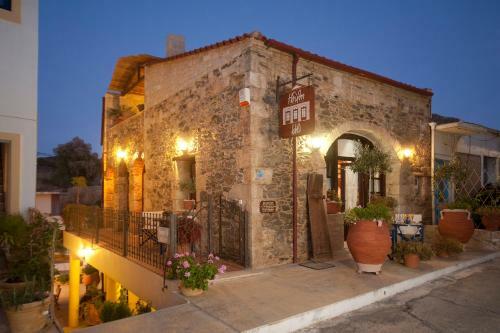 Pepi Studios are situated in the heart of Rethymnon�s Old Town. The studios offer easy access to the beach, an outdoor swimming pool with sun beds and showers. Pepi Studios offer a fully equipped kitchen with fridge. Situated in the seaside village of Plakias, Helios Apartments offers self-catering accommodation, just 20 metres the sandy beach. Within proximity, there is a bus stop connecting to the town of Rethymno. Set in the picturesque alleys of Rethymnons� Old Town, right across the public library, the Bellagio Luxury Boutique Hotel offers charming accommodations with spa baths and flat screen TVs. Situated 50 metres from Pigianos Kampos Beach, Keti Apartments offers self-catered accommodation with balcony. The complex overlooks the beach and includes a pool and a garden. Guests will find plenty of sun beds and umbrellas around the pool. 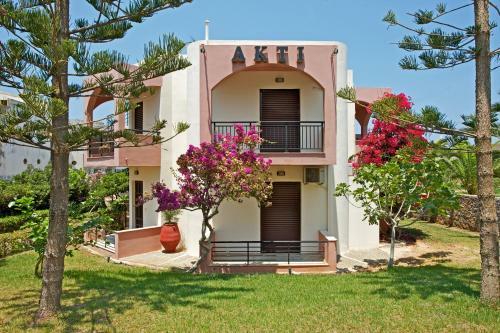 On the road to Rethymno, Akti offers self-contained accommodation surrounded by evergreen gardens, 15 meters from the Cretan Sea. It features free Wi-Fi access and rooms with sea-view verandas. 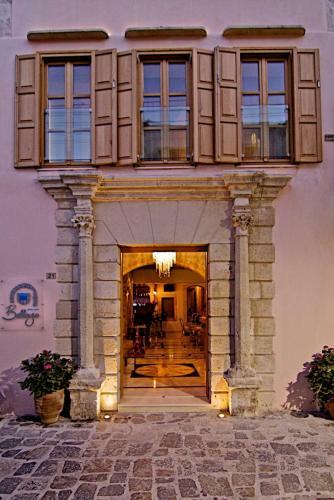 Barbara Studios are housed in a 1450's Venetian building in the heart of the Old Town of Rethymno. They feature rooms, studios and apartments with free WiFi, just 50 metres away from the port. Situated at the centre of Plakias, within a short distance from the beach, Studios Stella offer comfortable accommodation on Rethymnon�s south coast. The fully equipped studios and rooms come with a safe, air conditioning and shaded veranda. 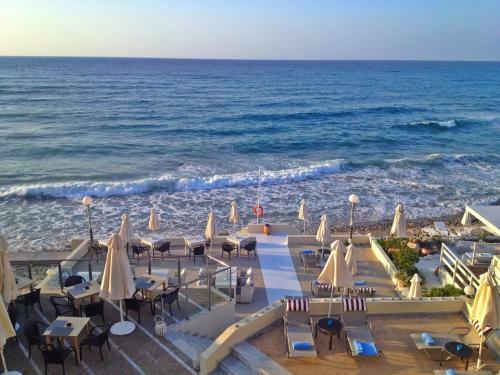 Aristea Hotel enjoys a beachfront location in Rethymnon, only 2.5 km from the old town. It offers a swimming pool, a pool for children and free wireless internet. Built within a 6,000 square-metre area of olive groves, the complex offers a seasonal, outdoor pool. It stands only 500 metres away from the sandy beach of Damnoni. Porto Enetiko Suites is located in the center of the old town of Rethymno within 30 metres from the beach and the Venetian fortress. It offers uniquely decorated accommodation with free WiFi.